Red Non-Woven Runner - perfect for rolling out the "red carpet"
MATERIAL: These runners are made from a durable spun-bonded non-woven material. You may be familiar with this fabric as the material that most airplane pillowcases are made from, as well as the material that many grocery tote bags are being made from. These rolls of fabric are available in many solid colors and also white and ivory with a stock design overprint. The lightweight material is puncture resistant (high heels puncture resistant) and can be reused with light use. 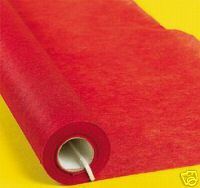 These are standard fabric rolls for you to put on your event's floor surface, pathway runners, walkways, grass, etc. - simply add your own adhesive or stakes, whatever you feel is appropriate for you to insure the safety of your guests. A lot of people purchase these runners to paint on, request as sample to make sure it will work for you! These fabric runners include a pull cord/ribbon.